I always tell my clients that it is actually good luck for it to rain on their wedding day. However, this doesn’t always stop the wet weather from dampening their spirits! But, just like any good and reliable wedding supplier, I do all that I can to make sure that rain on your wedding day doesn’t cause undue distress. We all just have to go with it on the day but it is important to have a ‘Plan B’, especially if much of the wedding is due to take place outdoors. Most UK venues will provide an alternative if you are caught out by the weather. For example, have your drinks reception in a function room instead of on an outdoor terrace. Here’s my experienced and expert tips which will help you to be prepared, whatever the weather. The Queen of spring florals is set to reign at the wedding of the year this May. As suspense builds across the nation for Prince Harry to marry his bride-to-be Meghan Markle, the countdown to the royal wedding is officially on. All eyes will be looking to Windsor on Saturday 19th May as each eagerly awaited detail of the wedding of the year unfolds. Say it with Flowers - Wedding blooms are one of the essential decorations to help make a really beautiful wedding. Michelle Marwood, Events and New Business, Co-ordinator at award-winning wedding venue Hylands House, Essex, gives an update on getting the right wedding blooms for your special day. Meadow flowers are still very popular and great to use in the early spring. Create bouquets and table centre pieces made up from flowers that look like they have just been picked fresh from the garden to give a traditional home spun look. Think of flower fairies and garden parties of old and you will be getting the right idea. Brides might also like to consider a flower crown instead of a crystal tiara to carry on the theme. Happy couples can relive their special day forever following the launch of a new, revolutionary bouquet preservation service and floral collection. The Wedding Collection and Lifetime Preservation Service, created by EnduraRoses.com makes the ultimate wedding day memento for bride and groom, and is available for as little as £25 per bouquet, with the lifetime preservation service costing £250. The British flower industry is undergoing a revolution with UK-grown flowers becoming more and more popular for a unique and memorable wedding day. Chocolate symbolises, as no other food does, luxury, comfort, sensuality and love. Chocolate has played an important role in wedding ceremonies from the Aztecs drinking a delicious cocoa concoction to the giving of chocolate as a wedding present from King Louis XIII of France to his new wife Anne of Austria. And so the love story with chocolate begins…. It’s official: Panetone’s colour of the Year is Greenery. Gone are the days of simply picking a colour for your wedding day. Today’s couples not only tend to select a whole colour palette, but they also work to a theme when styling their dream wedding. A trend appearing in more and more weddings is shabby chic / country garden with plenty of bunting, old apple crates and paper pompoms helping to achieve the look. Vintage and DIY weddings are set to be popular again in 2017. Shropshire Petals have just launched their pretty new Pink Rose Heads, which are perfect for adding some DIY styling to vintage or pink themed weddings. Together with their already popular cream rose heads, peony heads and rose buds, the pink rose heads complement the collection beautifully. Shropshire Petals share their top 5 ways to using their freeze-dried rose and peony heads. 1. Attached florist wire to the base of rose heads for adding into floral displays or bouquets for longer lasting arrangements. 2. Place rose heads in wheat sheaves with some other dried or fresh flowers for a pretty contrasting natural table centrepiece. Highgate Florist and Gardens have opened up a new floral service in the heart of their village, in East Sussex - where everyone is welcome to see, smell, pick and make their own floral arrangements and crowns for all their upcoming events and celebrations. Whether you are a bride to be, a maid of honour who is looking for a great and memorable event, or maybe even a mum looking for a great holiday event for your little ones to get their hands stuck in to. This is the place for you. Flower Fairies Create is the new service in Rotherfield which is fun, unique and something the whole family will love. How To Hire The Best Florist For Your Wedding! There are unlimited things to consider when planning a wedding. Couples need to hire a suitable venue, set a date. Guest list also needs to be prepared as well as invitations also needs to be sent out. Caterers need to be hired and menus need to be finalized. It seems like never ending line of interviews, contracts and decisions. Out of all these hectic jobs, there are some of the less obvious considerations that should not be overlooked - like hiring a florist. Sometimes, hiring of florist gets left out to the last minute and couples often find themselves struggling to get a good vendor who can supply Sunday flower delivery of flower arrangements they desire. Read more about How To Hire The Best Florist For Your Wedding! With over 30,000 products to browse at your leisure, including an unbeatable range of beautiful artificial flowers and a huge selection of stunning affordable glassware we are certain you will find something that takes your fancy. With more and more couples opting for a less traditional feel to their weddings, Country Baskets offers products to fit any theme, however quirky. You're having a woodland, nature inspired wedding? We have an abundance of beautiful barks, branches and rustic wood slices that are a perfect base for a spectacular centrepiece. Or perhaps you're looking for something that whispers, subtle and serene. The classic white wedding brought up to date with muted tones of green and grey. Country Baskets is the perfect place for you to create your perfect wedding! So, the date is set, the venue booked, the guest list written and re-written (five times!!) the colour scheme picked, the mood boards done, you are nearly there! Now all that is left is the slightly daunting task of recreating that vision. Read more about Country Baskets is the perfect place for you to create your perfect wedding! Picture it – walking down the aisle with a beautiful array of flowers, stunning colours that radiate across the room and emit flawless radiance. However, these flowers are not the kind that will need to be put aside following your special day. 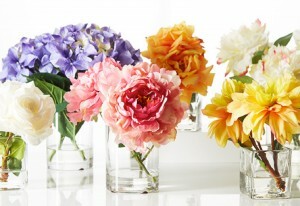 These are flowers, that like the memories of your joyous occasion, will live on in blossomed perfection. Get creative with Country Baskets, we stock the UK's largest supply of beautiful, affordable and realistic artificial flowers. Visit us in-store or online for a huge selection of wedding décor and accessories that are perfect for making your day both extra special and personal.